Call on 01832 742 026 or use the ENC on-line Fly-Tipping Report form. Abandoned or untaxed vehicles can be reported to ENC using the on-line form. 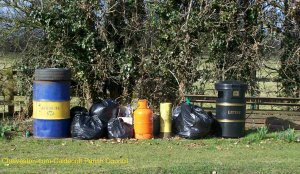 The Parish Council organises an annual "Spring Clean" litter pick and reports fly-tipping etc for collection. A number of volunteers in he village regularly pick litter to keep the verges tidy. Results from "Spring Clean 2009"
"Spring Clean 2016" took place on the weekend 23rd / 24th April, with some residents who can't make that weekend doing their litter pick in the weekends before. Many thanks to everyone who volunteered. Please note we are always happy to loan out litter pick kits through the year!